I am so tired right now, need sleep, news later. A bunch of Red Shirts on this page I will link tomorrow. Hahaha, first the page was late and then I forgot to write up a news post. I RAWK. Poor Yehti. He spent all the time grading those papers and now they're ruined. 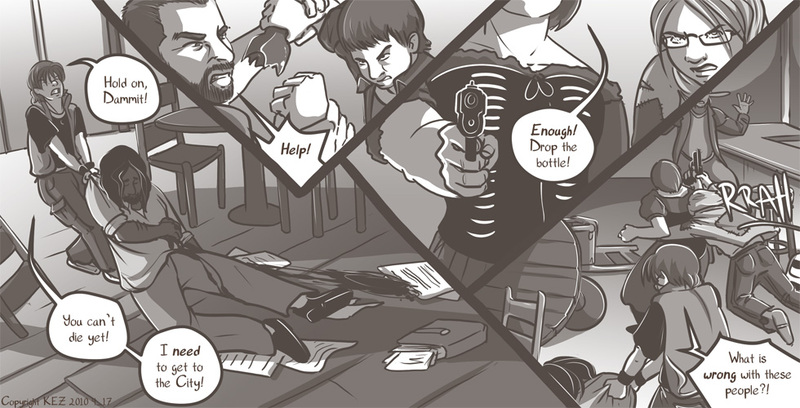 In today's page, Sharon T Rose's plan for that gun get interrupted by Bugbyte! Meanwhile, Andy and OnyxSparrow continue to try to kill each other. HOW WILL IT ALL END?! I will be so happy when this arc is over and I don't have to draw so many people. The next arc, "Scot Free," is only 5 pages away. Some people have been asking about it, and I'm happy to announce that I will be able to offer the extra updates in January again! If you're new to the comic, I collect funds for the extra updates leading up to the available dates. Each extra update is $20, and regardless of the amount raised, the comic WILL update W/F to schedule. Extra updates will be extra, and not a make up for missing a W/F update. If you put $20 or more in the pot and take care of an entire update, I will mail you a complimentary issue 1 with an original drawing in it to thank you for supporting me and this comic. :) We've already got one extra update for January in the pot, and I'm mailing out that personalized What it Takes issue 1 today!